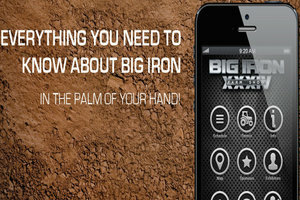 The new Big Iron Farm Show mobile app will help visitors navigate around this year's event. This year’s Big Iron Farm Show, the largest farm show in the upper Midwest, will take place September 9-11 at Red Rivers Valley Fairgrounds in West Fargo, North Dakota, providing agricultural producers and enthusiasts with educational sessions, demonstrations and more. The 34th annual event will welcome visitors from 9 a.m. to 5 p.m. on Tuesday, Sept. 9 and Wednesday, Sept. 10, and 9 a.m. to 4 p.m. on Thursday, Sept. 11. With more than 900 exhibit booths, training sessions, and demonstrations, the Big Iron provides an opportunity to connect with agribusiness peers. The event will provide an opportunity to visit with exhibitors and learn more about the latest agriculture equipment and technology. Attendees will experience informative field demonstrations and health screenings sponsored by North Dakota Living, and have a chance to chat with other farmers and ranchers. A new Big Iron Farm Show mobile app has also been implemented to help participants navigate around the grounds and stay informed about happenings. There are a variety of useful resources and activities for farmers, growers and producers to gain from this year’s Big Iron Farm show.